The annual Emsworth Arts Trail offers the chance to see and meet designers, painters and makers in their own homes and studios. The majority of the venues are located within a mile of the town centre. Bookends of Emsworth is hosting a work by The Hole in the Wall Pottery Group who are a non profit making community pottery that meet weekly at The Pottery, next to Emsworth Community Centre, North Street, Emsworth. Emsworth Arts Trail brochures with information all the artists and venues are available at Bookends of Emsworth and other local shops. WemsFest are giving free sunflower seeds to every household in and around Emsworth. This is an enjoyable and colourful project that will help everyone to understand the importance of flowers to birds, bees, and our environment generally. Seeds are available from a number of shops including Bookends of Emsworth. The 4th Fishbourne literary festival is being held at St.Peter and St.Mary church on Saturday 30th March 2019. There will be talks by five authors including Kate Mosse who appeared at the very first event in 2016. Tickets for entry into all talks are £25. The day is for book lovers of all descriptions, but if you’d just prefer to browse the huge selection of second-hand books, then please come along for free. Refreshments will be served all day. The chosen charity in 2019 to receive 50% of the profits is Stonepillow. As always the other 50% goes to St Peter and St Mary Church, Fishbourne, to meet the costs of essential repairs. 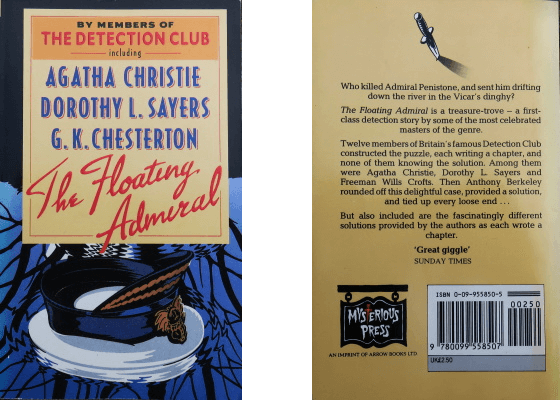 The Floating Admiral is a treasure trove from the past, the very first publication of Britain's famous Detection Club. If you enjoy detective stories then this is a book not to be missed. Bookends of Emsworth usually have several Agatha Christie books in stock so why not pay us a visit and browse our selection of these and other detective novels. Join Emsworth Horticultural Society on Friday March 15th 2019 at 1.45pm for a 2pm recording in Emsworth Baptist Church Hall hosted by Rebecca Parker. Bring along your questions to put to local gardening experts Andy McIndoe and Pippa Bensley. Tickets are on sale at at Bookends of Emsworth at £2 for members and £3 for non-members, to cover the hire of the hall and refreshments.